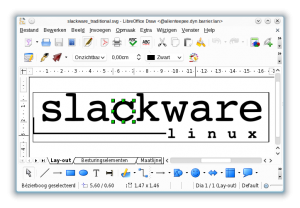 So I finally built my Slackware packages for LibreOffice 3.3.1. It took way too long, but I hope you like the result. A lot of additional language packs are available this time. One thing I had overlooked was that the new LibreOffice branded icons were not installed by default, so my package is still using the old OpenOffice.org branded icons. Next time, the old icons will have been replaced with appropriate new icons, I promise! Thanks to David for noticing and reporting that omission. For completeness’ sake: my own packages are built from source, on a Slackware computer. There is another way to get LibreOffice installed and that is to take the official pre-compiled binaries (unfortunately only available as RPM packages) and use the SlackBuild script at http://slackbuilds.org/ to extract the goodies from these RPMs and create useful Slackware packages out of them. Which of the packages you use is a matter of preference. The RPMs are not built on a Slackware box but they are guaranteed to work… probably on older versions than Slackware 13.1 too. Posted: 2 March, 2011 in Slackware, Software. Eric, you are the best…downloading now…many thanks…again. Thank you a lot for this job. Thanks Eric! KDE 4.6.1 on the way? KDE 4.6.1 packages are ready even, and I am running it now… but I have to wait with uploading those packages, until Pat releases the pending batch of updates to -current. My KDE 4.6.1 has been compiled against several unreleased packages so I am not sure they will work on the version of -current that you have. Thanks Eric for this great job! Is possible to have the x86_64’s packages? I read “My KDE 4.6.1 has been compiled against several unreleased packages so I am not sure they will work on the version of -current that you have”, but I whise to try it. Very THANKX for your Wonderfull Work!